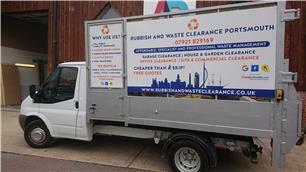 Rubbish and Waste Clearance Portsmouth - Rubbish/Waste/Clearance based in Stubbington Lane, Hampshire. Welcome to the Checkatrade page for Rubbish and Waste Clearance Portsmouth, the leading independent recycling company in the south of Hampshire. We're professional, reliable, friendly, uniformed and licenced waste carriers. Our services include household waste removal, house clearance,garden waste removal, building waste clearance, office clearances and site clearances. We're fully-licenced and monitored by the Environment Agency to carry all waste - so there's absolutely no chance of your rubbish being slyly fly-tipped. For more information visit our website www.rubbishandwasteclearance.co.uk, alternatively call or text Mike or Dave on 07921 829169.